Tonight is the semi-final playoff game for the Screamin’ Eagles. In the several seasons I have been on the team, we have never made it past the semi-finals, though we get to that game regularly. Our flag football team has had a decent season, but we picked up a former pro basketball player who is now our star and haven’t lost when he plays. Hopefully, we win the semi-finals game tonight at 5 then get to play in the championship game at 7. Today was “Seafood Friday” at the Old Country Buffet in Factoria, so B and Sae and I hit it up. “Seafood Friday” meant that they were serving clam chowder AND “Baked Fish”. No specification on what exactly the “Baked Fish” was, but my guess is herring. I hadn’t been to the Old Country Buffet since I was about 11 years old. At that age, I thought it was the greatest restaurant in the history of mankind. I was a poor, starving child. The Factoria Old Country Buffet actually isn’t bad for what you get: $8.19 all-you-can-eat salad, Mexican and various fried foods. I had written Microsoft off as being out of touch and about to collapse on itself. However, I may have judged too soon. The behemoth company based out of Redmond appears to be putting up a fight. Microsoft either just launched or is launching a slew of cool products and has significantly strengthened others. Bing is Microsoft’s powerful new search engine, Silverlight is unleashing the full .Net framework for developers, XBox just sold its 30 millionth box & has a community of 20 million monthly users, and many other areas are looking up too. I think that they need to offer some of their paid dev tools for free though if they want to compete with Flash better though. I now have skype on my iPhone. Please add me as a contact to your skype. Send me your skype username. Mine is joel02078. Google announced a new product that they will be launching soon called Google Wave. 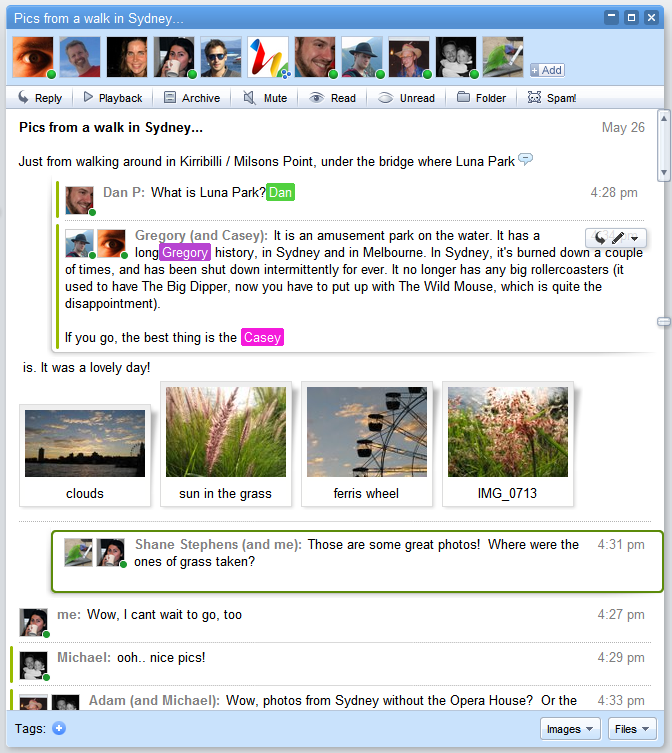 It melds chat and email in a whole new way with a ton of amazing functionality. I am excited to be able to use it! Attempted to climb to McClellan’s Butte past Mt. Si on I-90E Saturday. Failed due to lack of equipment and realization that climbing steep ice alone may not be smart. Sunday went on a bike ride with my brother from Orting to Puyallup. Visited the White family and ate good food at their BBQ. Rode back to Orting. That night went to Shawn’s house and drank beer with him, his fiancee and family. Next morning (Memorial Day) had a beer breakfast and headed to Nick’s parent’s house to go out on their wakeboard boat. Boat’s battery was dead, so we played catch instead. Chopped wood for my grandpa in midafternoon and had iced tea with my grandma afterwards. Back to Seattle to get eleven hours of sleep. Worked on creating a web application measuring the number of positives & negatives in client search results automatically for a coworker. Almost done, but can’t get the SqlDataReader to connect with the stored procedure properly. Ran five miles at lunch. Exercised at Bally’s after work; must get in shape to mount Mt. Rainier. Plato and I somehow ended up at a college party tonight and I found myself talking to a girl in attendance. She asked when I graduated; I said “College 2006”. She looked at me funny and said “I graduated high school in 2007”. Ouch. Be careful if u r on i90. Cops are ticketing people left and right. Used to going out to “areas” of town to find bars like Capitol Hill, Fremont or Belltown, Nick and I tried to do the same thing in Bellevue. After driving around looking for awhile (and making a side trip through the millionaire mansions on Medina), we ended up at Lincoln Square. Lincoln Square is basically the entertainment center for downtown Bellevue and reflects Bellevue’s character or lack thereof quite well. Lincoln square is a very high-end mall/entertainment complex featuring a huge IMAX cinema, 16 screen regular theatre, Lucky Strike (overpriced bowling), Parlor (huge brand new pool & dance hall), Pearl (night club frequented by the Seahawks) and a variety of smaller bars and restaurants. Nick and I went to the Parlor and played pool for an hour, then spent most of the rest of the night in the dance area. I was amused by how immaculately clean and nice everything in the building was… there was none of your usual stains, smells or weirdos that you find inside of bars. In the dance area, there were at least three security guards at all times PLUS two uniformed police officers…. all to defend against well-dressed rich kids. When I left and went outside, the streets of Bellevue were equally clean; no bums, whores, bail bond places, or even anyone who made under $40,000 a year. I got a little creeped out by the Big Brother feel of it all. I’m used to Seattle where there are bums everywhere getting drunk and harassing people, random fights, and crazies everywhere. Gotta say though: if I ever have kids they will only be allowed to hang out at places like Lincoln Square lol.